This post was originally blogged here – but old fashioned browsers don’t seem to like it! Euan Semple is my kind of guy. This may shock many a parent and school teacher. It should not: the media has whipped us all into a paranoid frenzy. Our two young daughters have grown up with their own Macs, and Apple devices and have always taken for granted their unfettered access to the Internet. In contrast, I am dismayed that so many parents seem to have caught themselves up in this paranoia. They struggle to grasp the disadvantage their children face by not having open access to the Internet. Our 8 year old daughter learns on YouTube. She chooses what she learns and teaches her parents every single day. I’ve heard many parents ban YouTube in their homes. Whilst Schools are doing a sterling and very necessary job teaching our children about internet safety (and us parents have to work hard to safeguard them too), I am willing to bet that most schools have locked the internet down in a similar fashion to many parents at home. What a shame, your children are losing out. Over a London lunch, I convinced Euan to visit Suffolk on Monday the 2nd of June at 730pm, I’ve hired the Seckford Theatre, at Woodbridge School. Euan is a great speaker. Ordinarily we wouldn’t be able to afford his speaker’s fee but he’s helping an old friend: There is nobody better than Euan to counter any Net Paranoia that we may be experiencing. He’s witty and engaging, I am confident you will have a fun, thought provoking evening. I don’t have time to waste on the internet – why should I pay any attention to what happens there? Who is running the internet and why is it so messy and uncontrolled? Why shouldn’t schools protect my children from the internet? How do I use the internet to learn and help my child get better at using it to learn? How do I manage online relationships with my children? Isn’t a good thing that the government is protecting us with its filters? What does privacy mean with the advent of the internet? How do I know what the truth is and who can I trust on the internet? Please visit our event site at http://netparanoia.com, tickets are now on sale and selling quickly – so please grab one. You can also book tickets at £12 each by following this link. You can download the A5 flyer here too. I’ve decided to focus on building Inn Style. You can still find me blogging about online technology here. Instead of decommissioning this site, I’ve decided to leave it here, there’s been some interesting conversation and continued traffic. I’ve met some great people helping them with their ideas. But, to be very honest, the economics haven’t been worth it. It’s hard to charge people for this kind of advice. I end up giving it away over a coffee or pint, I will continue to do that, if you open the tab! Thanks for supporting AOB. Bootstrap is a design framework opensourced by Twitter that helps your site be responsive. Responsive means the design will react to different screen sized. Most importantly it means that you don’t have to pinch and zoom into a site on a small screen. We’ve been at it for over a year. It’s taken far too long but this week we launched our first product. Please welcome Demand Beer into the the fold. We concede: there hasn’t been much to celebrate yet. But then most brands have served nothing more than their E-commerce offer framed in Facebook. We don’t think this is F-Commerce. In fact, we are yet to see anything earth shattering in the F-commerce space and that’s why we decided to do something different. We think F-commerce is about sharing a buying experience. It should be about clubbing together with a few friends to buy something together. How about a gift? We created a platform called PlainSocial.com. The proposition of implementing PlainSocial is a real cracker! It’s a marketeers’ dream to have multiple people involved in a single sale: a powerful word of mouth amplification. Take DemandBeer.com for instance: A case of cider delivered to the recipients door costs £40. Find 20 people and all they have to do is contribute £2 each. Hardly felt by each contributor’s pocket – the recipient feels loved by all their 20 friends and in so doing we manage to reach 20 people in this single transaction. We’re pretty convinced that the whole ordering process is so frictionless that several of the 20 people will return when left scratching their heads for a gift for someone. Please indulge me by reading this and donate 50p – I want you to be the first to experience a game changing service in the UK. Up until now, taking micro payments online hasn’t been feasible from a cost point of view because of the high merchant fees charged by Visa, Mastercard and American Express to name but a few. That’s now history with the advent of a very disruptive little UK startup called Go Cardless. It’s been funded by several stellar VCs like Accel Partners and YCombinator so rest assured of its credibility. The amazing thing about GoCardless is it facilitates the collection of money through the direct debit system in the UK – therefore it does what it says on the tin – It is entirely cardless. You sign up to GoCardless much the same as creating an account with Paypal. When signing up you setup a direct debit authority which GoCardless will use to collect any money you authorise to be sent. You can use your GoCardless account at multiple merchants. The cost to the merchant is a mere 1% of the transaction with a maximum of £2! The merchant can setup one-off payment requests or recurring payment requests and these requests can only be authorised by you in a secure environment. Obviously this is a game changer for the UK market as it suddenly makes all sorts of business models feasible. Let your mind go…. But before you do- Please help me out? Where I see some amazing value is in micro payments for charity. If I follow a link to donate £1 – the charity receives 99p! See what you could do with this? Now, it’s no secret that we support The Suffolk Foundation – for those of you who don’t know the Charity – it funds grass roots organisations in Suffolk that are in desperate need of help – often too small to have their own charitable status. (read the Hidden Needs survey they commissioned a while ago). Please comment on this post when you’ve followed the donation procedure – letting me know how easy it was to setup. If (for any reason) you decided against it, please let me know why. Thank you for your time, your 50p and for indulging me! You can now call yourself an early adopter – one of the first few to use a truly disruptive technology. PS – if you are a conservative, doubting Thomas, let me assure it’s totally safe. Gocardless.com is governed by the direct debit guarantee and is registered with the FSA as a small payment provider – the payment partner is the Royal Bank of Scotland. Nothing can leave your bank account without your request and authorisation and is far safer than using your credit or debit card. BT disrupts online giving market. Who would know? BT a disrupter? Who would have thought it? And it seems to be a well guarded secret too! In this post I analyse three competitive online giving sites and BT comes up trumps. Just Giving was the first to market and invested heavily to educate us and create the, now, much accepted culture of online fundraising. I take my hat off to them as, with any early adopter, they have funded the markets’ education and arguably need to recoup that investment. Their pace of innovation in very recent years has increased too and their offering is robust and very usable. But, it comes at a price compared to the two other products now on the market. I am willing to bet that most of you haven’t heard of BT myDonate whereas a see quite a bit of fundraising through Virgin Money Giving. This post compares the three offerings from a cost point of view. I’ve chosen not to analyse the features of the online providers since I think the core offering is what people are most interested in and the core of all three remain consistent: If I’m promoting a fundraising event I can easily host a fundraising page online allowing me to have my supporters sponsor me using a debit or credit card. All three offerings require the charity to sign up with the service in the first instance. Sadly this seems unavoidable since, amongst other things, the online provider needs to deal with the Gift Aid registration of the underlying charity and to collect bank details ensuring that they are able to remit the funds raised to the charity safely and securely. Because the bulk of the small charities are not VAT registered I am quoting the VAT inclusive figures in my analysis as I’d prefer to track net cash cost. At the time of writing the VAT rate is 20%. So, if you can claim VAT back then adjust my figures please. BT doesn’t charge the charity to register or a monthly fee for membership. Just Giving charges £18 per month and Virgin £120 up front. If you’re a larger charity, you may argue this isn’t a barrier or significant cost. If you’re a small charity, then I’d argue it is! Merchant Fees Let’s first talk about the fees the payment processing costs us. BT is clear about what their payment provider charges: 1.3% for credit cards and 15p per transaction on a debit card (they don’t accept Paypal). Virgin charges 1.45% on all cards (even debit) and 1.6% for Amex and Paypal. Just Giving tell us Barclaycard charges 1.3% but doesn’t tell us what the charge for debit cards or Paypal. Reconciliation of Gross Donation to net proceeds to the Charity. When it comes to charity Every Little Bit Counts. I think the above numbers speak for themselves and the charities I advise will be moving over to BT myDonate. I’d be interested in your views. I gave up caffeine when I became a vegan a while back. Now days, I get a kick out of herbal tea! 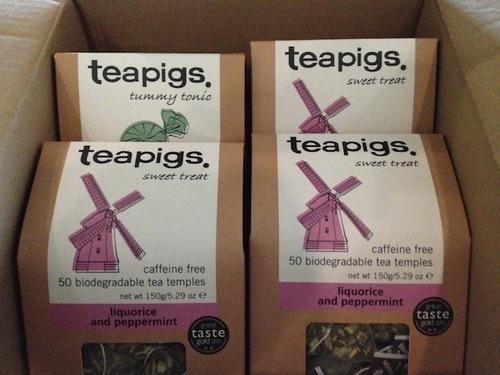 There’s a particular tea that really fills the coffee gap (for me) – Peppermint and Liquorice from Tea Pigs. I used to tweet about it with enthusiasm, spreading the Tea Pigs word. Without @teapigs, giving up Coffee would have been impossible. Have you tasted the peppermint and liquorice? Talk about an addiction! Tea Pigs on Twitter have never replied to any of my complimentary tweets so my excitement when this morning’s Tea Pigs delivery arrived never made it onto my Twitter stream. Gary Vaynerchuck in his really engaging book “The Thank You Economy” (certainly worth a read – at the very least Tea Pigs, your social media team should read it) convinces the reader that it’s time for brands to engage with their customers and proves why the social amplification is a power not worth ignoring. Now, you’ll argue that I continue to buy Tea Pigs tea because of its quality and that therefore the brand hasn’t been damaged by their lack of engagement on Twitter. That may be true, but I’d like to offer up two arguments to try and convince brands out there to get out and have a conversation on Twitter with their customers. Stop using Twitter to broadcast message – that’s the old world of push marketing and it doesn’t work any more. Argument 1: If Tea Pigs had engaged with me on Twitter in the past, I would continue spreading Tea Pigs joy in my social media circles. I already know a handful of my social media friends who discovered Tea Pigs and regularly order from them because of tweets like the one above. I no longer am a brand advocate because I feel they’re too arrogant to buy into the Thank You economy. Argument 2: I would show a lot more loyalty and stickiness if Tea Pigs had engaged with me on Twitter but they haven’t. So when another tea provider comes along – and frankly I’m looking for one after being a little peeved with Tea Pigs lack of transparency about being owned by Tetley – I’ll drop Tea Pigs without a second thought. I am writing this blog post so I can refer the many friends and clients that don’t ‘get’ Twitter to a little cast study -so many won’t engage in conversation. If you’re reading this Tea Pigs – please – it’s too late to make a fuss and no, I don’t want a freebie thank you! Perhaps this is my last Tea Pigs order? Anyone know a comparable Peppermint and Liquorice tea from a truly Independent Tea Provider? UPDATE: When I tweeted this post I deliberately avoided mentioning @Tea Pigs in the tweet. It was impressive that Hannah from Tea Pigs did comment on the post later in the day so brownie points for their media monitoring! Within minutes of my tweet I had recommendations from my followers – First recommendation was @lahlootea and then a few including @foodsafariuk recommended Pukka teas. Hats off to both Lahloo and Pukka for engaging with me on Twitter almost immediately. Not only are they truly independent but appear to have a lovely herbal tea range. I shall be ordering soon. Then Helen Tarver ( @presentqueen ) commented on the post below and added Bellevue to the mix. And then, drumroll, as if by magic, Pukka launched their Peppermint and Licorice blend. I’ve just placed an order. Thanks everyone – now do you see the value of using Social Media to engage properly? I still stand by placing our bets on Facebook, its social graph and what you can achieve with group buying (f-commerce). Firstly, Facebook is still growing as a marketplace with over 800 million users. It accounts for a very hefty chunk of web traffic now owning 95% of social media networking time. The advent of the timeline has been endorsed by many including one of my favourite sages, JP Rangaswami in this very reasoned post. I’m also pretty pleased with our decision to build our Facebook/opengraph solutons on the force.com and Heroku platforms allowing us to build scalable, cost effective solutions for our clients and The First 65 products. You’ll see us release something rather smart next year for a very well respected Suffolk brand as well as use this technology to power a few of our own products like 65 Winks. If you haven’t considered Facebook in your 2012 strategy, you either need a very good reason or simply put (and I am sorry to say it): you’re foolish! He goes on to explain that if you want to start a startup the best thing to do is to study the problems that exist in the world today and create a solution for one of them. It’s a post worth reading. Let’s just focus on the post-it note though. Many ideas find their way into my inbox and I almost feel like attaching this checklist to my email auto-responder. In my experience the biggest issue lacking from these opportunities is the Easy Path to DISTRIBUTION which is pretty much linked to a SOLUTION being marketable or not. Rarely do business pans have credible and affordable distribution plans. Your product might be the cure to a real-world problem but how are people going to discover your product? Apart from anything else, this post-it note is the best framework for a business plan I’ve seen in a long time. We'll prompt you to consider topical issues, new technologies and "quick wins" Sign up here to received the newsletter.